Dazed Digital: This is your second exhibition, do you feel that your career as an artist will now run along side your career as a musician? Faris Badwan: I've never thought of drawing in career terms. I wouldn't even have occurred to me to exhibit were it not for the prompting of others. DD: Your music and artwork have a definite aesthetic have you always leant towards the dark side? Faris Badwan: I suppose I like things with a certain intensity or weight to them but only because to me that sort of thing seems less throwaway. DD: What are your visual influences? Is there anyone in particular who you draw inspiration from for your pictures? Faris Badwan: I like Paul Klee a lot… I find that I tend to discover artists through drawing rather than the other way around - someone will see something I've done and say "You must be a fan of.." and I'll have never heard of them. 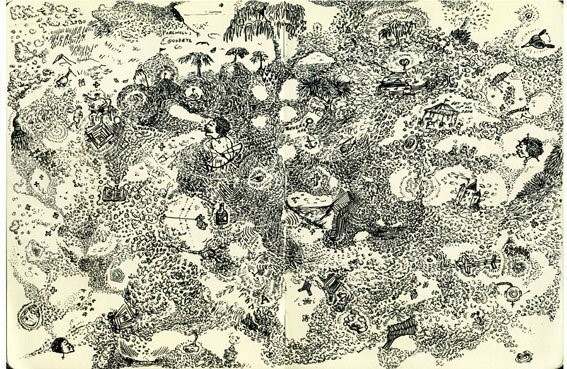 I remember reading about outsider art for the first time when I was about 15 or 16 and I thought it was incredible - often the observations seem so warped but in a very natural way. My youngest brother used to do some brilliant drawings after seeing my sketchbooks and they in turn would really inspire me - I'd end up liking his versions so much more! He did a picture of a smiling man with a balloon on a string for a head, which I had framed. When the Horrors were on tour in the UK last year a primary school teacher gave us a whole collection of drawings, done by her class of 7 and 8 year-olds, in response to 'Sea Within a Sea'. She made them all listen to it and draw what they heard... They ended up doing all sorts of abstract patterns and shapes, the colours were fairly similar to what we had on our CD inlay strangely enough..
DD: I have had a look at some of your work on the internet- it seems to be very illustration based do you think you will continue in this vein? Faris Badwan: I used to like sculpture and painting but drawing is the main thing I've always been interested in. DD: You seem to be a bit of a polymath (music, art, events) is there anything else you would like to turn your hand to? Faris Badwan: Things occur to me and I become frantically obsessed with them for a while - I started building a castle out of wax recently but so far all I've really made is a mess. To be honest if I were talented enough I'd just jack it all in and become a footballer.